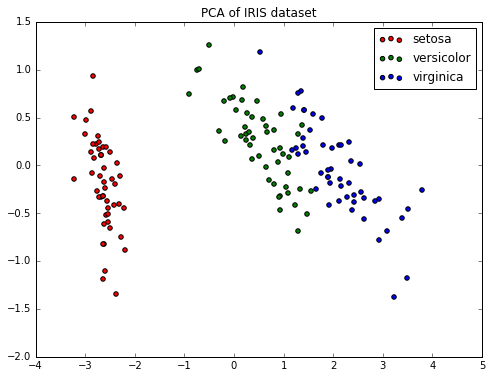 This article will look at the benefits of using Principle Component Analysis to reduce the dimensionality of our datasesets. We will show that high dimensional datasets can most often times be expressed using only a few dimensions and that reducing dimensionality can make our datasets easier to work with and decrease the training time of our models. The MNIST dataset is composed of 28x28 pixel images of handwriten digits. Typically when training machine learning models, MNIST is vectorized by considering all the pixels as a 784 dimensional vector, or in other words, putting all the 28x28 pixels next to each other in an 1x784 array. Not many datasets are greater than 784D (dimensions), and if you have ever worked with high dimensional datasets before we know that training time and prediction time are proportional to the size of the dataset and the number of features (dimensionality). Before we go a further we should have a small discussion about dimensionalty and why it’s important. In simplistic terms, it is just the number of columns in the dataset, but it has significant downstream effects on the eventual models. At the extremes, the concept of the “curse of dimensionality” (wiki) discusses that in high-dimensional spaces some things just stop working properly. Even in relatively low dimensional problems, a dataset with more dimensions requires more parameters for the model to understand, and that means more rows to reliably learn those parameters. If the number of rows in the dataset is fixed, addition of extra dimensions without adding more information for the models to learn from can have a detrimental effect on the eventual model accuracy. On my modest hardware (2016 macbook pro) it took about 1 minute (54 s) to train and predict with a 4.3% error rate – pretty good! Now let’s experiment and see if we really need all those dimensions??? If we take all of our training examples and look at the variance of each feature, we can build a covariance matrix that will give us a quantifiable way to show variance across examples in a feature. This means that each feature has a variance that contributes to the overall variance. Is variance equally distributed among features? Are some features more expressive of the dataset and some not contributing any information? If so, then we can remove those features form our training set. The above figure shows how much variance each feature contributes to the whole. 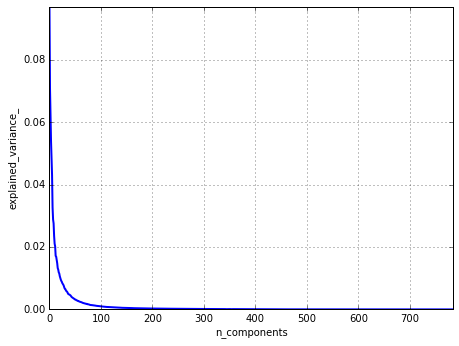 The x axis represents our Eigenvalue/vector pairs which correspond to a feature in the original dataset. We can see that after about 150 vectors, the subsequent vectors don’t contribute much to the whole. We can probably cut out the last 634 vectors w/o losing much accuracy with our classifier while at the same time decreasing training time! At this point, we have the same Eigenvalues and Eigenvectors that we generated ourselves in the previous steps. However, now we only selected the top 150 and Scikit calls them components_. 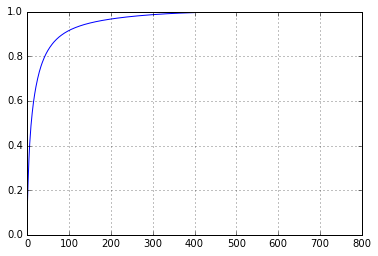 So applying the PCA transformation is simply a linear combination – very fast. Now we will apply the projection to the training set and any new data that we want to tests against in the future. Our classifier finished in about 3 seconds and has an error rate of 4.9%. Thus we experienced a 94% decrease in training time and only a .6% loss in accuracy! So as you can see, PCA has some pretty compelling results when applied to machine learning tasks. Reduced dimensionality leads to faster training!